Well then. I guess there’s only one thing left to do. The French pastry blog. Croissants, Pain au Chocolat, and Chouquette…oh my! Research for our upcoming trip to France and Belgium has lead me to some pretty delicious spots in the city. One morning I sat down with my latte to read the newest edition of City Palate Magazine and spotted an advert for Pascal’s Patisserie. The light bulb went on over my head as I remembered reading a previous issue and trying to figure out where exactly the shop was. I then promptly forgot about sussing it out. Soon the call of freshly baked croissants was too strong to ignore. I put on my big girl pants and drove to the Manchester Industrial area, a sketchy area in South East Calgary where the workshop is located. There are several other less dodgy places to pick up your French pastries but I specifically wanted to go to ‘la source’. Once there I ran around the outside of the building for a while looking for a way in to the shop. I felt like a goldfish butting my head around the windows until I was spotted by the manager, Lison. She let me inside through the main door which of course I had discounted since it inconveniently was missing an outer handle. I think this oddity can be overlooked because once inside I was bombarded with the scent of a thousand pastries proofing. Ahhhhh. Bliss. It was around 1:30 pm and since I hadn’t had lunch I ended up oogling the small basket of baked croissants more than once during our animated and entertaining visit. I felt like a Dalek (from Dr. Who) whose job it was to ‘exterminate, annihilate’ those croissants. Luckily I was able to hold myself back. 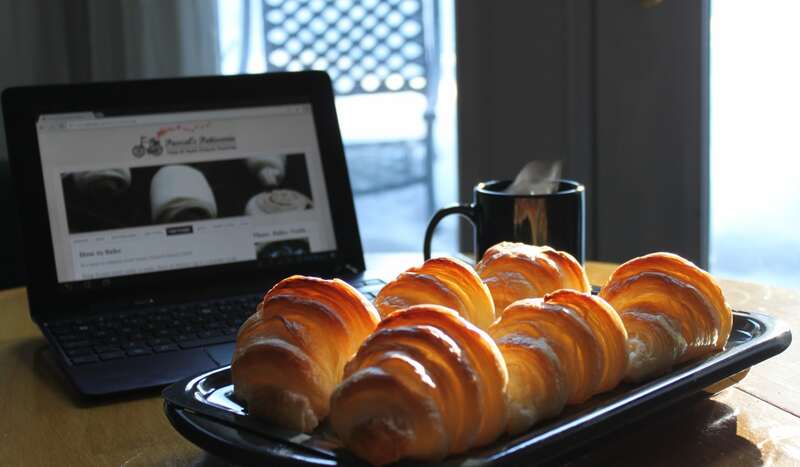 Classic Croissants– the standard measure of a properly trained French pastry chef. 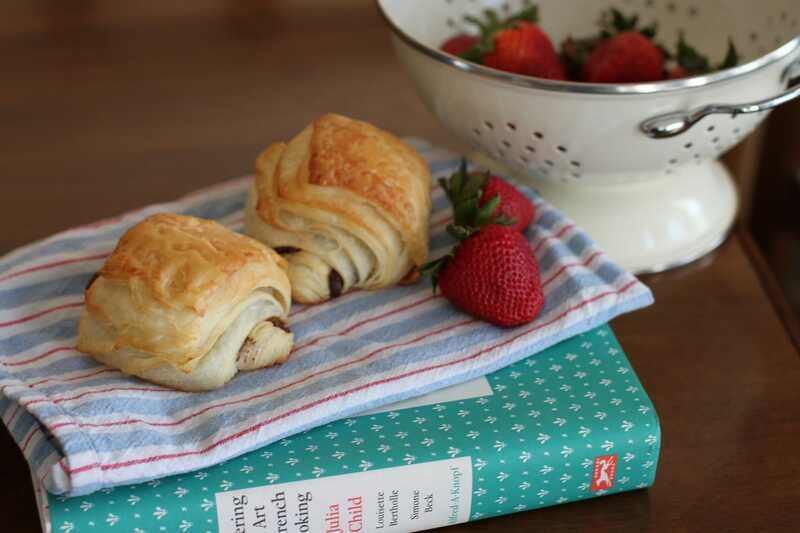 Pain au Chocolat– Lison tells me that this is a popular after school snack for children in France. I think if I made these for my kids every day after school I would win the mother of the year award! Puff French Pastry– It comes in flat sheets, no need to roll it out. 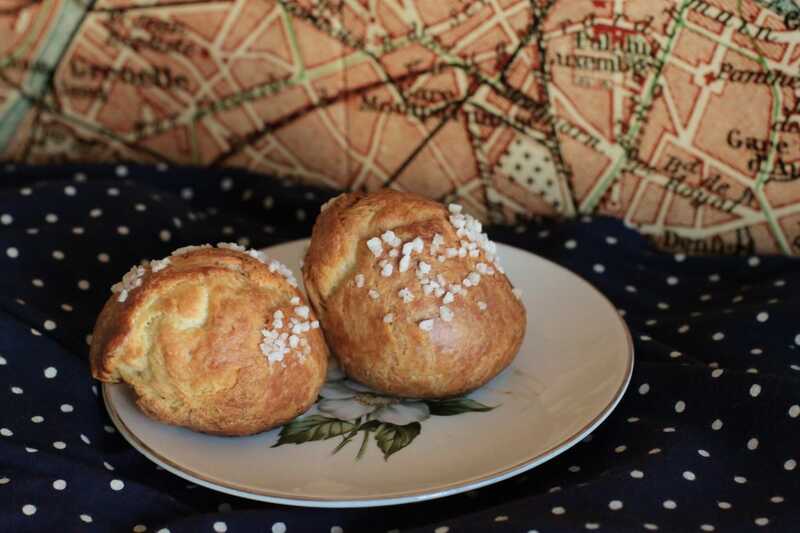 Chouquette– Pastry puffs sprinkles with Pearl sugar. The first one I baked was the Pain au Chocolat. I couldn’t resist giving the kids one glimpse into the life of those lucky children in France. Of course, they will eat anything with chocolate in it but I am pretty sure I saw their pupils dilate as the first bite hit their bloodstream. The second treat I chose to bake were the croissants. Hubby and I had a ‘weekend away’ at Lake Louise and I decided to bring along some delicious treats so that we could make our own breakfasts in the chateau. Let me just say these croissants are super hardy. They will go through a lot and still bake up quite nicely. Upon arrival I noticed that the tiny fridge in our room had been turned down so much that the ice from the freezer was melting and water was dripping everywhere. As I had planned on proofing the croissants overnight, I panicked a little. It was then that I noticed the large sheet of Aluminum foil at the bottom of the oven. I tore it off and placed it over where I was going to set the tray of croissants, like an umbrella. Next, I realized there was only a tiny broiler pan upon which to set my croissants. I just had to hope they had enough room to bake properly. The next morning while I was waking, hubby decided to take matters into his own hands and threw the croissants in the oven, then turned it on. Luckily I got up in time to rescue them and properly heat the oven. After all of that, they turned out lovely! I’m glad I made a point of finding Pascal’s Patisserie. Their pastry products are top notch and I’m so glad they chose to produce them in Calgary. It’s like a little slice of Paris heaven in the Canadian west. I love these guys. For a while, my Saturday routine was to go to Gravity in Inglewood and grab a cup of Phil & Seb coffee and Pascal’s almond croissant. Perfect way to brighten up your day. Me too! We just got back from France (as you saw) and I’m having croissant withdrawl….Guess I’m going to have to pay Lison a visit! Do you know we couldn’t find almond croissants in France? They are croissant purists!